1. Is gender a determinant for how much an artist earns? 2. Is nationality a determinant for how much an artist earns? Both questions can be answered to a degree. The latter isn’t as impactful, as nationality didn’t appear to significantly influence how much an artist earned or the likelihood that someone could make a career out of comic art, at least once they got in to begin with. The gender question is trickier, though. 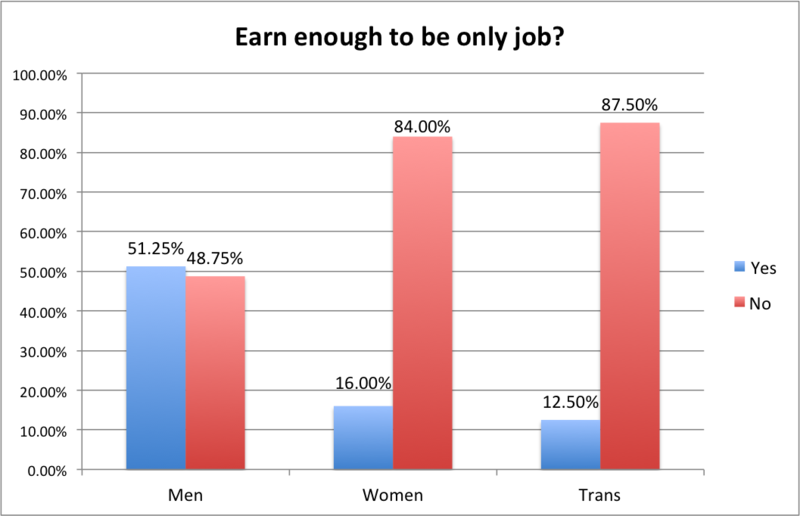 According to survey results, artists who were not cis men make less than those who are, and it’s not close. What it lacks in closeness, it makes up for in complexity, making the answer to the question more of a yes and a no. This isn’t a cut and dry answer by any means. A point of importance to factor in when going through these results is that this study is imperfect and not statistically significant. One hundred and eighty-six people responded, but not everyone responded to everything in every question, and there were far more men that responded than women and trans*, non-binary and agender responders. Don’t let this create a complete vision in your mind. This is just how things are for those within the subsets of artists I’m analyzing, and it may or may not reflect the whole. Please keep that in mind going forward. In the charts, Trans represents anyone but men and women who responded. I know that is not accurate, nor is it fair. 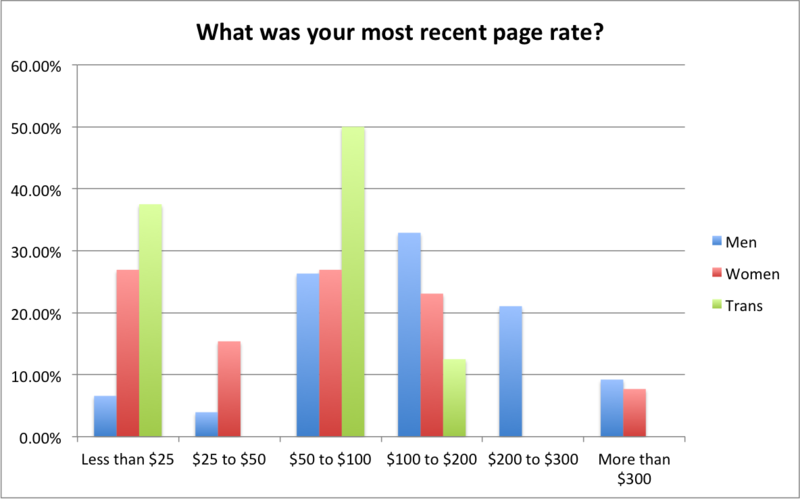 While Microsoft Excel is the former most of the time, its interest in fairness is limited, and the subset had to be reduced due to spacing issues. My apologies, and I hope you understand. Instead of explaining things to start, I will let the data do that for me, as it’s easy to figure out where the yes comes from by just taking a look at the three charts below. 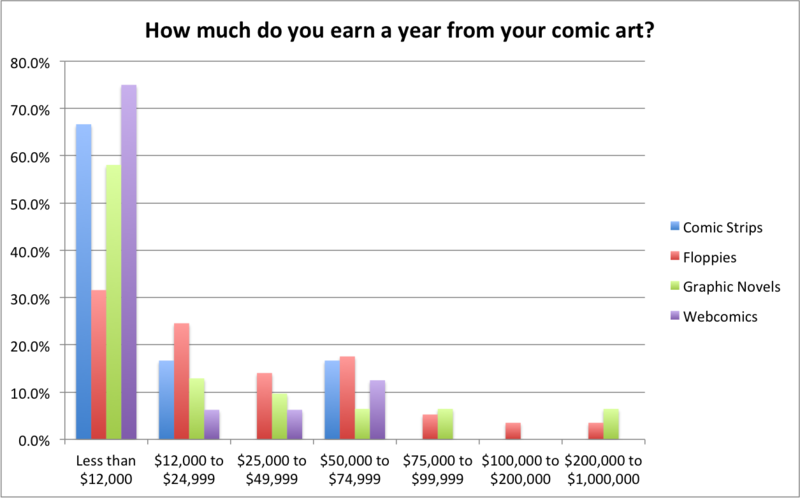 Those charts show that for the respondents to the survey, non cis male artists are less likely to be able to make comics their sole occupation, a higher percentage of them have income levels from their art at or below the poverty line, and they also have lower page rates. In short, the data reveals a career as a comic artist is much more less prosperous if you are not a cis man. There isn’t much else to be shown, is there? There’s a clear divide between genders in financial terms, and that’s of great concern. But it is also something that might be explained elsewhere in the data. Not all artists are created equal, and that goes for those of different genders. Yes, if the only thing you look at is the gender-based data, women and trans*, non-binary and agender artists make less money. That is true. But is there a correlation between gender, income level and a third unknown variable? Perhaps. The first variable I looked at in parallel to gender was experience. As you can see above, the respondents who are women or trans*, non-binary or agender had usually worked in the industry for a much shorter span of time than cis male respondents. 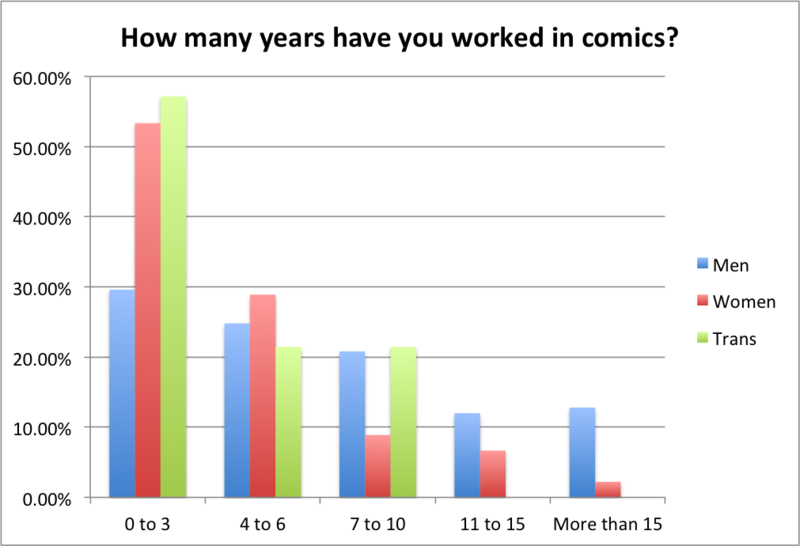 As with any career, comic artists make more money the longer they work. However, as reasonable of an assumption as this would be, experience wasn’t the determinant. This is what muddies up the water. The most common formats to find artists who are women, trans*, non-binary or agender are webcomics and graphic novels. While some are artists on floppies, webcomics are the clear format of choice (or opportunity) for the artists who responded. That doesn’t tell us much of anything, but when you combine it with other data, the picture begins to clear up. When you take the data for the comics creators work on and cross-reference it with the variables based around money, that’s when you see an additional correlation. 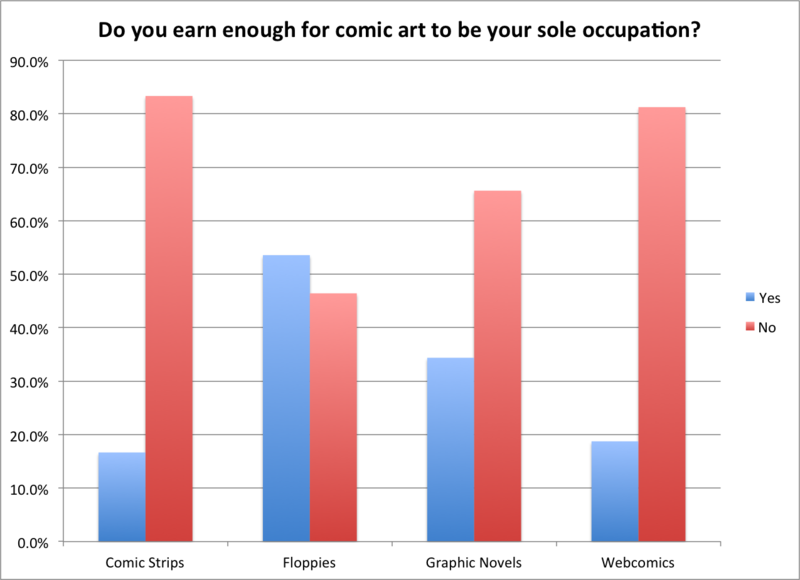 More than half of floppy artists make enough money for that to be their only job. It’s the only format where that is the case, with over 80 percent of webcomic creators being unable to make a living off their work. 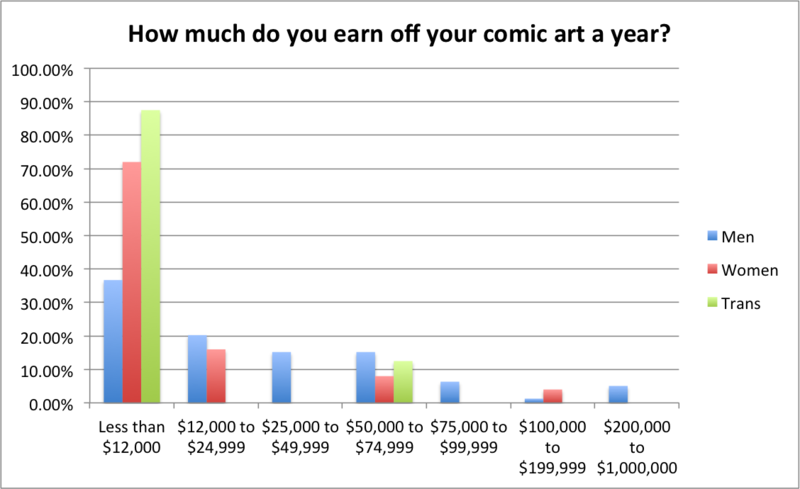 Additionally, the majority of graphic novel and webcomic artists who responded make less than $12,000 a year off their work, and as a whole make less money than those who work on floppy comics. 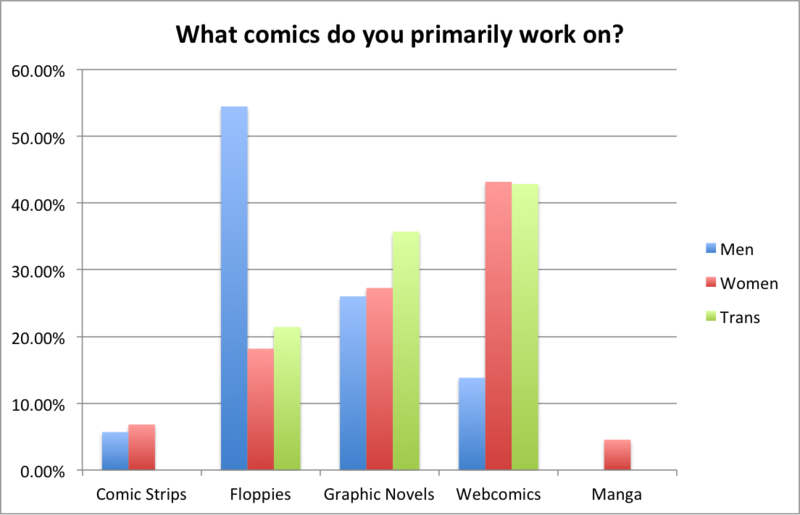 As shown above, while men work more frequently in floppies, women, trans*, non-binary and agender artists most often work in graphic novels and webcomics, per the survey. Because of that additional correlation, the question becomes a chicken and the egg one: were the non cis male artists who responded more poorly compensated because of their gender or because of the format they work in? So is Gender a Determinant for How Much An Artist Earns? Going further, a consensus forms in the middle. When comparing cis men with non male artists in like formats, none of the women or trans*, agender or non-binary respondents who work in graphic novels make enough off their art to make a living, while more than half the cis men said they can. For floppies, it was 50/50 for women, another zero for trans*, agender and non-binary, and more than half for cis men once again. Those numbers on the surface are concerning. In like formats it seems men are more affluent in the comic art game. But there’s an important consideration to factor in. When we slice and dice the list in such a way, you run into dangerously low quantities of respondents, and ones no statistician in the world would say represent a greater whole. That means it’s hard to tell if it’s the reality of the situation or one created by a small sample size. While the numbers do show non cis male artists make less money, a combination of factors cloud the viability of those numbers. This makes it impossible to conclude what the true deciding factor is from a statistical perspective. Do I personally believe that gender plays a part? Absolutely, especially given how it influences income in other fields. But I’d likely get a frown and an “F” from my college statistics professor for making that assertion, and with good reason. Another interesting question from all of this is why is it that non cis male artists who responded were so concentrated in webcomics and graphic novels? We know webcomics have a lower barrier to entry, while floppies have gatekeepers that are largely cis white men. Is that a factor, or is it simply a question of interest? I’m not sure. Perhaps that’s a question for another piece. Header image originally appeared in a studio feature on Charlie Adlard from Multiversity Comics’ Artist August.